We had a late breakfast with Ruth's family in Guelph yesterday morning. Didn't get any photos. Just a greasy spoon breakfast, but we left with our stomachs full and we didn't need any lunch. From Guelph, we headed into downtown Toronto. My mother grew up in Toronto, and we wanted to go for a walk on the street where the house is that my grandparents owned. When I was a kid, we made a lot of trips to Toronto to visit my grandmother, and I remember those trips well. The house was part of a duplex, but both units were bought by somebody about ten years ago and with a huge amount of renovations the duplex was made into a single family home. I used to walk to this corner store as a kid when my grandmother would give us each a nickel to buy some candy! In the photo above, the gate was slightly open. So we went and knocked on the door! A guy answered, and I explained the story. He invited us in to have a look around. He has been there for six years. Of course the interior is entirely different than what I remembered as a kid... when the renovations took place, they almost completely demolished the original house. Only the facade and the wall separating the duplex remained. Everything else was built new. Only the brick facade is original. My grandmother owned the house from 1935 until 1975, I think. I may not have the figures exactly right, but I think they paid $3,500 for it back then! When she sold it in 1975, I think she got $35,000 for it. It's worth about two million now! From there, we walked about two blocks up Parliament Street to the St. James Cemetery. This cemetery is the oldest in Toronto, dating back to the 1840's. It's also where my grandparent's plot is. We last visited the grave in 2008. The office was closed, so we couldn't go check the records as to where the plot is located, and it's a huge cemetery. But an online site called findagrave.com had it listed as being located in the "East Ravine", so we found a map board at the entrance and headed to that area. Sure enough, we found it! There's been a lot of ground movement and the stone has come off its base. From there, we walked back to the area where Toronto's Riverdale Zoo used to be located. We made a lot of trips to that zoo as kids because it was walking distance from my grandmother's house. The zoo closed many years ago, but now the area is called Riverdale Farm, and it's a real oasis in the middle of the busy city. Really fun walking around the area with all the old homes. It's a beautiful area, and it's easy to see why the homes are so high priced being such a short distance to downtown Toronto. From there, we drove to our friends Dave and Maggie. Dave is one of my friends that I've known since I was 16 years old and I'll be seeing him again at our guys weekend away two weeks from now. Had a great evening with them, and we slept in their spare room last night. Kevin, Ruth, Maggie, and Dave. This morning, Ruth made me a cup of the chicory coffee substitute drink that I like. I had a sip, and mentioned that it didn't taste just right. Thought maybe it was the tap water, but wasn't sure. I continued to drink it, but about half way though I mentioned it again. "This definitely doesn't taste right". Ruth suddenly says "Is it possible I put salt in instead of sugar?!" I don't take much sugar... less than half a teaspoon. Sure enough, she goes to the bowl that she took the "sugar" from, and tasted it. Yep, it was salt. We both had a laugh about that! Nice to visit places you enjoy many years ago. I lived in Toronto near the beaches then Scarbourgh until I was 19 then headed west to Kitchener/Waterloo areas, So many memories of things then . Great that you got to visit your friends there as well. I think Kevin really enjoyed his trip down memory lane and being able to tell me stories of his childhood from his visits to his grandmother's. We have never really spent any time in Scarborough, maybe sometime we will have to explore it a little more because I never knew it had beaches. Not really beaches in Scarborough just Blufffers park, The beached were in east end to Toronto near the end of Queen Street. That was a beautiful old house that your grandparents owned. At the time they only owned half of it. It is really interesting that someone bought the two houses and made it into one. They really did a fantastic job, it looks like it was never a duplex to begin with. Kevin says he remembers that too and a bear but in those days you didn't really think about that. After they built the Toronto Zoo and moved the animals there, the animals must have thought they died and went to heaven. I think Toronto Zoo was one of the first to have huge natural type enclosures for the animals. When the "new" Toronto zoo was opened in 1974 to replace the Riverdale Zoo it was the largest of its kind in Canada and is still the largest zoo in Canada today. It is one zoo that we don't mind visiting because it is so huge and natural, however we would still prefer to see the animals in the wild. Love old historic downtowns...especially old homes. I always think they are full of ghosts as I rented some old homes in downtown Phoenix before they did the 'revitalization' of downtown. Eeery things would happen in those old houses and one apartment complex smell like formaldehyde. Come to find out later the apartment complex use to be a mortuary years before. I use to love the porches on those old homes...they were lovely. We'd sit out in late afternoon and watch people walk by. A block front from one house we rented for years use to be a grocery store...tiny but the store manager knew everybody in the neighborhood. We could get a tab running in between pay days if we needed for milk, bread or eggs. It had a rooster high up over the store. The house and store and the Rexall drug store are all gone now. Some old bldgs. were renovated and made into law offices. I miss those days of small town feel to Phoenix when everyone went downtown to shop and visit beauty salon or barber shops, big grocery stores, ice cream shops etc. All have been replaced with high rise office bldgs. and banks. Two old hotels and an opera house were saved and a couple of historic bldgs. but they look out of place among the shinning glassy tall buildings. BTW love the article on your grandma's old house. 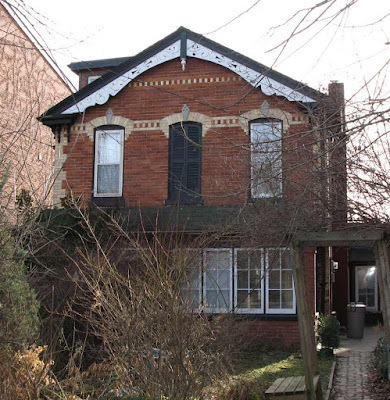 The old parts of Toronto are amazing to see, we love the old houses and buildings. We have been to Phoenix before but never went downtown. We enjoy seeing a mix of new and old together. Interesting post today! So your Grandmother Marjory lived to 98 - great genes in your bloodline!! Really enjoyed the pictures of Toronto! The 'corner store' must have been torn down and rebuilt as it is totally different. I guess he doesn't remember the corner store quite as well then because he didn't notice the changes only that the corner store was still there. Ah you know your getting old when you start going back to places and going down memory lane. Your story adding salt instead of sugar made me laugh. Years ago when I was making gravy for a turkey, I used icing sugar instead of flour. We thought it was something to do with the basting of the turkey. I guess it probably does start to show your age a little but it sure is fun to do. Especially to see how much things have changed over all those years and surprisingly enough Kevin said that they haven't changed a lot over the years, at least the few blocks that were close to his grandparents house.